Signed up for Chitika and not profitable? Blending tips: Even the font is customisable! Customers with JS off will see no ads. How you can profit! Have others work to earn you money in Chitika! Target the ad based on keyword visitor last used in Google! 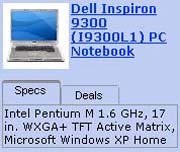 Example: The example to the left is targeted for product "laptops", and set to show the "Specs" tab first. Feel free to have a look at the source code of this page (View > Source in IE, Ctrl + U in Firefox) and modify it for use on your own site. You can replace the "Specs" in the code with "Deals" or "Search" depending on your preference, and if your ad is one of the wider ads, like 728x90, the tab options are "Description", "Best Deals" (not "Deals"), "Reviews" and "Search". If you're using the 160 x 160 ad the only choices are "Best Deals" and "Search". Simply look at a sample ad in the eMiniMalls code page on the Chitika site and you'll know what tab options you are getting in your chosen ad size. Note that there are two variables, for the title and the text. And, for both, you can set a range of fonts as fallback in case the first one isn't available on the user's computer - as we've done with the Font Title. Why disable Chitika search if you're running Google search? The example on the right is from a screenshot made when that line of code was in the script on this page. Build your channels info into your ads from now. If all the adblocks on the page look exactly like each other visitors are less likely to click on them. Create some variety. Mix Google text ads with your own banner with YPN ads with a Chitika interactive ad. This page tell you how to do it safely and within the respective programs' terms and conditions. If you're running Adsense you must be aware of Public Service Ads (PSAs) i.e. the ads that Google serves if it can't find a relevant ad for your page. However, you can set a default alternate ad. If you're setting up a page on your site especially for this purpose - stick the Chitika eMiniMalls code in there. Then place the URL for that Chitika eMiniMalls page in your Adsense code. All perfectly acceptable with Google! Now you can earn money from Chitika when Google doesn't have ads to fill the space provided. Don't believe us? Email Adsense support and you'll see that they have no objection. It must be noted that this is a good fail safe in more ways than one. Even if you always see targeted ads on your pages people in other countries could be seeing PSAs on your pages. Having an alternate ad means that nobody ever sees PSAs. Further, there may be the odd occasion when Google is updating something, has a glitch, or otherwise can't serve relevant ads. You could be seeing days of declining incomes before you caught the problem. At least with Chitika as your Adsense Alternative you'll make that money up elsewhere. Need help with finding the right products/keywords? If you have a fashion related site, for example, you can use keywords ranging from handbags to moisturizer to specific brand names like Prada and Jimmy Choo. And Chitika will show your regular visitors accessories, sweaters and related fashion items to keep them from getting bored with hand bag ads. And you're more likely to get a click. Remember to use single quotes for the keywords in this scripting example. Rotating keywords based on day of the week. Playing around using the "Search" feature in the ad? Trying to see what products different keywords call up? Do it on the Chitika home page rather than on your own site and you won't mess up your stats. As per the advice on the Chitika site - if you narrow your product down and specify it as a keyword in the code you'll likely see a substantial increase in income. Try different keywords in Chitika's search to see what products they have in their database that will be the closest match to the content of your page. There is no contextual system as good as YOU! But, before you do this see the previous tip about testing keywords on the Chitika site. Download this plug-in, put it in your wp-content/plugins directory, and activate it in your plugin configuration page. Once done you'll see a new tag in the Quicklinks toolbar. Simply click on it to insert an ad in your post. If you run into problems try x74.org/index.php/2005/10/02/eminimall-plugin-for-wordpress. Using the custom feeds that are already in WP. Don't forget to replace anees with your own affiliate ID. Don't forget, also, that the referral 10% is paid only for the first twelve months from sign-up. Refer yourself - you're not limited to having just one account! Combine the fact that you're not restricted to a single account... with the affiliate program, and what have you got? A quick way to make an additional 10% approx. Case 1 - Joe Bloggs signs up after clicking our link: He makes $80 on his big site and $20 on his small one. Case 2 - Joe Bloggs signs up after clicking our link but sets up his account in Mrs Jane Bloggs' name. Jane Bloggs then puts her code on the small site and refers Joe Bloggs who opens another account and is her "downline". Joe Bloggs puts his code on the big site. Earnings from the sites are still the same: $80 + $20. But, as Jane referred Joe she gets an additional sum of 10% of $80. Total earnings are now $108 instead of $100. Sometimes an ad can end up with just one tab and when it does you lose the catchiness of the mouseover changes - the ad becomes static, argh! This happens particularly when there are only two tabs available for your given ad size and you turn off the search tab. Check the ad live after you've published it to your site. Losing the interactivity of the ad can cut your CTR by over 75%. Use Server Side Includes (SSI) or Frontpage Include pages. Experienced webmasters already use them to minimise the work involved if you ever have to change the coding in the ad. Some of these tips are covered, albeit slightly differently, at the Chitika site.